Earn $3.44 in VIP credit (344 points)What's This? 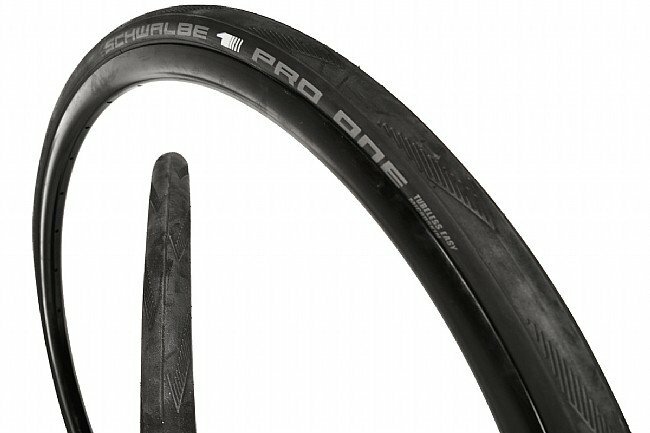 Schwalbe ups the ante in the road tubeless department with their Pro One Road Tubeless tire. It's 70 g lighter and features 15% less rolling resistance than the previous One tubeless tire, and this is in big part thanks to Schwalbe's MicroSkin technology. By vulcanizing a high-tensile micro fabric into the carcass, MicroSkin creates an airtight seal, even at high road-tire pressures. It also has the benefit of adding more cut resistance all around. Combined with a OneStar triple-rubber compound, the Pro One is as sticky as it is fast and reliable. 700c diameter. Available in multiple widths. Claimed weight is 255 g (700c x 25 mm). 3 of 4 customers found this review helpful. I just started using tubeless tires. Talk about a compliant and more maneuverable ride. I won't go back to those pesky inner tubes. 15 of 17 customers found this review helpful. Road tubeless tires aren't cheap. These are reasonable with BTD's usual sale price in the low $60 range. They're light and they roll exceptionally well. I've been doing road tubeless since it became available and have used every Hutchinson road tubeless tire made. They're decent but I totally prefer these Schwalbes to any other road tubeless that I've used. I run with about 2 oz of Stans in each tire and have put about 1400 miles on this set. We have a lot of rough pavement, glass and debris on many of the roads where I live, and so far, no major cuts or flats with reasonably careful riding and using a glove to brush the tires if I run through something suspect. I run them with 80 psi front and rear (I weigh about 160). The reduced pressure doesn't seem to make them roll any slower and they feel super plush. I opted for the 700 x 25c size, and they're pretty fat. So fat, they just clear my fork and stays on a Cervelo R3. But the ride and the grip are outstanding, these things just roll as smooth as butter. The rear has started to wear a flat spot in the middle but it's not yet an issue. If I don't cut them, I can probably get 2000 miles on the rear before I'd think about changing it out. I love the extra volume of the 25c but because of the tight clearance on my frame and fork, I may go with the 23's next time. These are the fastest and smoothest tire out there. I like the Specialized Turbo cottons but they are now my second best. The tubeless tires take a little getting used to but when you learn how to fill the tire you need to have the the right chuck. Then it all works well. It's nice to ride with 10's less air, it makes the ride so much smoother. If you do get a whole it seals then you just need to add air. This tire is a little bit pricey compared to others, even Schwalbe lines, but they have a great combination of puncture resistance, low rolling resistance and are tubeless. They feel like they want to run. When punctured, they lose about 6 pounds of pressure, but I dont even stop. I get about 800-1,000 Miles per set and usually change them before they get too flat topped. My favorite tubeless road tires. I find these are the best all-around performing tubeless road tires. The ride nice, are quiet and have great traction dry or wet. They wear like a race tire so don't expect a ton of miles out of them. I have had punctures with these tires, and use sealer, so small punctures are not a problem. As the tires wear and get thinner, they are more prone to puncture. A little hard to get on the rim but well worth it. Roll fast, very nice. Made ride smoother. No problems with punchers. Very pleased. These are a great tire in use, but I have seen multiple tires with gashes across the sidewall and have to believe this is a defect. I won't be buying these again, which is a shame because I have a pair left to put up with and hope the same defect doesn't show up. I use the 28mm tire on my Roubaix S-Works. Very fast rolling and great for the occasional dirt road foray. I've lost one tire to glass in the road I didn't see, but other than that I can't think of a better solution for a road rider with the usual lousy roads we encounter in CT. Sorry to hear, our Customer Service will reach out more to hear more about what happened. Great tubeless tyre. I got the 25mm width. Easy to mount (I use a compressor), rolls well, comfortable, & inspires confidence. No flats yet and very few cuts in the tread. I had to replace the original Schwalbe Pro One I had mounted because after 100 miles it developed a small bump on the wall of the tire. This new Pro One has been holding up well. Good tubeless tires and wear reasonably well. One issue I've had is initial inflation. They just don't pop and seat well even with an air compressor. When you get the tire I recommend mounting it on an old rim with an inner tube and let it stretch or roll it inside out and wrap it with rubber bands or a velcro tie. The tire will then seat itself easier - I highly recommend using an air compressor regardless. Once installed its a great performing tire. Great tread life but hard to install. My first pair lasted more that 3000 miles. The next pair not so good from the start! The rear tire went on with a little effort and sealed up right away. The front needed the same effort BUT as I was filling it up I could hear air leaking it was coming from the sidewall from several small holes. These did seal up but they started to leak air over night and the tire was flat the next day. When this pair wears out, if the front one makes if that long I'm going to try another brand! I now have a bout 120 miles on my 25mm Pro Ones mounted tubeless on Bontrager Aeolus Pro 3 wheels on my 2018 Trek Emonda SL 6 Disc. This is a great combination and I am very happy. I plan on getting another set when these wear out. 2 of 3 customers found this review helpful. I am very happy with these tires. They are extremely puncture-resistant. They roll fast and smooth and have good traction. The 25mm width fits on my rims. Highly recommended. I moved to tubeless after getting a new wheelset (HED Belgium rims). I have used only these tires since buying the wheels in March. I have put over 2,000 miles on these tires and they are holding up very well. They are fairly durable, supple, have good grip and roll fast. I have used these tires in 10 races and they are fast and inspire confidence. One thing to point out is that the 25mm tires on these wide rims measure around 28mm wide. There is very little clearance between the tire and the rear right chain stay on a 2013 Cannondale CAAD10. They fit and ride fine, but they just barely fit. It would be more aerodynamic to use the 23mm tires, but the ride quality would suffer a little. I use the regular Orange Seal sealant (not the endurance sealant). I had one puncture in July (after 4 months of use) that did not seal because I did not have enough sealant inside the tire. All of the initial sealant had dried up, and I did not remember to add more. I put in a tube and rode home. After adding more sealant, the puncture sealed. These tires are relatively easy to mount to the HED Belgium rims, but I needed to use an air compressor, my floor pump was not able to do it. Last year I rode my regular clincher wheels with Conti GP2000SII tires. I had over 10 flats last season, This year I have ridden the same roads with only one flat, and it was my fault for not adding more sealant. I am convinced that tubeless is the best option for road riding. These Schwalbe tires are a little pricey but worth it to me. When I put these tires on, my first tubeless. I loved the ride and the way they grabbed the road. I put them on a couple hundred miles before beginning a 545 mile trek from northern to Southern California. By day 5 of the 7 day journey, I got a puncture that the sealant couldn't handle. I added a tube which lasted a day and when I changed the next one found the tire to be pretty thin. Maybe 700 miles. Put a patch on the inside of the puncture this time and rode the tire the rest of the way. Probably wouldn't buy again, too much money per mile. I do think it a great performance tire though. The different types of road bicycle tires and how to select what is best for you.